Hibiscus syriacus is a very beautiful, hardy deciduous shrub. Vase-shaped and upright with broad green, palmate shaped leaves, the numerous blooms have a very distinctive form. Luxuriant large trumpet-shaped flowers with prominent white stamens appear in solid colours of white, red, purple, mauve, violet, or blue, or in bicolours with a different colored throat. Easy to grow, naturally resistant to most pests and highly tolerant of air pollution, heat, humidity, poor soil and drought. With its lush tropical appearance and numerous varieties of blossom colours, it can provide a satisfying gardening experience even to the least experienced gardeners. Hibiscus syriacus come into leaf in June. The green shoots make interesting indoor vase cuttings as they stay green for a long time. The numerous buds that are produced on the shrub's new growth provide prolific flowering over a long summer blooming period. The flowers, in shades of blue, pink and white begin to open in late July and will continue to decorate the bushes until early autumn. A valuable attribute in gardens where the summer colour seems to come all at once in June and early July. Sowing: Sow indoors at any time of year. Plant in spring or autumn and grow them on in the greenhouse for their first year to plant them out in early summer of the following year. For best germination soak seed in hot water for 48 hours before sowing. Change the water ever 12 hours with fresh hot water. Sow in trays or pots of well drained seed compost, cover seeds with a sprinkling of sieved compost. Darkness will help germination. Place in a propagator or warm place, maintaining an optimum temperature of 24 to 27°C (75 to 80°F) Germination can be erratic usually between 30 to 90 days. Prick out the seedlings into individual pots when they are large enough to handle to grow on. Plant them out into their permanent positions after all danger of frost has passed and protect them with a frame or cloche until they are growing away well. Plant out into a well-drained humus rich fertile soil in a sheltered position in full sun. Mulch will hold moisture into the soil in summer and help protect the roots from freezing during the winter. Leave a little space around the trunk to allow for good air circulation. If the mulch is pressed right against the stem or trunk, it will contribute to rot and will kill your new addition. Replenish your layer of mulch in the autumn to help prepare your plant for the winter months. Watch out for “bud drop.” If your plant begins dropping blossoms prematurely, you will know that you are not watering correctly. Frequent shallow watering or excessive watering can cause blossoms to drop. Hibiscus syriacus come into leaf in June. The stems are silvery grey and you would not be the first gardener who had dug one up thinking that it had shuffled off its mortal coil. But stay your hand and your spade for the very lateness of the hibiscus is its strong point, especially when it comes to the flowers. Naturally, blossoms will begin to fade as they have lived out their lives. Be sure to deadhead the spent blossoms to make room for new blooms. Regular deadheading will extend your blooming season. Time your pruning to suit your preferences. If you prune in the autumn, just before winter, and prune back severely, you will encourage larger blooms in the spring. If you prefer lots of small flowers, prune lightly in the springtime. Remove dead, broken and damaged branches and any nonproductive branches. This will encourage air circulation and allow sunlight to reach your plant. Once your plants are established, you can count on them to provide a glorious display throughout the summer months, even in challenging conditions. 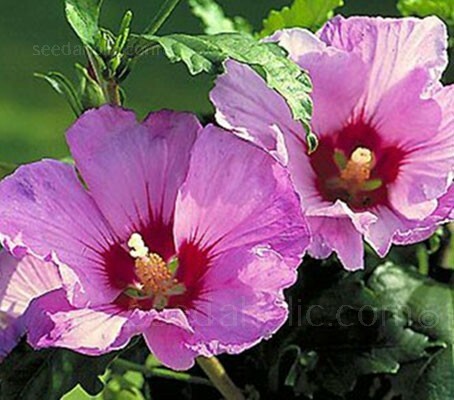 Rose of Sharon is hardy and can tolerate both cold winters and drought conditions with ease. Extreme cold weather can kill off branches above the ground. If your area is subject to extremely harsh winters, you may wish to wrap your bushes when a hard freeze is expected. The flowers of Hibiscus syriacus begin to develop their seed pods in October. The green seed pods then take six to fourteen weeks to mature and ripen. The seeds grow in pods with five lobes, with three to five seeds forming in each lobe, the pods will become brown and dry when they are ripe, then each lobe will split open and disperse the seeds. If left on the plant through winter, the seeds will provide food for small birds like goldfinches and wrens. If conditions are right, the remaining seed will drop near to the parent plant and become seedlings in the spring. Collecting seed is not always easy because they ripen in winter and need this cold period to properly germinate in the spring. The seeds can be collected before they ripen, but they should be allowed to dry out, then placed in a paper bag in the refrigerator until you are ready to plant them. If they are harvested too early, they may not ripen or produce viable seed. A simple method of seed collection is to put nylon or paper bags over maturing seed pods in late autumn or early winter. When the pods pop open, seeds will be caught in the nylon or bags. Store the seeds in a paper bag in a cool dark location until you are ready to sow, and remember to label and date them. Hibiscus syriacus is a species of flowering plant in the mallow family Malvaceae. It is native south-central and southeast China, but widely introduced elsewhere, including much of Asia. It was given the epithet syriacus because it had been collected from gardens in Syria. It is the national flower of South Korea. Called mugunghwa, it first became the national flower of Korea during the Japanese colonial era (1910-1945) when it was overwhelmingly selected by the people as the floral symbol of their nation. The flower's symbolic significance stems from the Korean word mugung, which means 'eternity' or 'inexhaustible abundance'. It is also refered to as the Korean Rose. Cultivars of H. syriacus are widely planted in areas with hot summers for their attractive white, pink, red, lavender, or purple large and edible flowers. There are a number of cultivars that have gained the Royal Horticultural Society's Award of Garden Merit. The genus name Hibiscus comes from the Greek hibiskos meaning marshmallow. It is a member of the mallow family, Malvaceae. It was named by Pedanius Dioscorides, a botanist and a doctor for the Roman army and the author of the De Materia Medica. The specific epithet suggests the plant comes from Syria which is false because it is native south-central and southeast China. 'Rose of Sharon' is a common name that has been applied to this and several other species of flowering plants that are valued in different parts of the world. It is also a biblical expression, though the identity of the plant referred to is unclear and is disputed among biblical scholars. In neither case does it refer to actual roses, although one of the species it refers to in modern usage is a member of Rosaceae. The deciduous flowering shrub known as the Rose of Sharon is a member of the mallow family which is distinct from the Rosaceae family. The name's colloquial application has been used as an example of the lack of precision of common names, which can potentially cause confusion. 'Rose of Sharon' has become a frequently used catch phrase in poetry and lyrics. The common name Flower-of-an-Hour, or Flower-of-the-Hour, refer to the flowers brief appearance while the name. Bladder hibiscus refers to the translucent seed pods, the pollinated but unripe seedpods look like oriental paper lanterns, less than an inch across, pale green with purple highlights. The symbolism of the flower dates back hundreds of years. A gift of hibiscus is believed to mean 'seize the opportunity'. It also stands for delicate beauty as the bloom of the hibiscus is just open for short period everyday. The Hibiscus flower represents everything that is female related and are usually gifted to females no matter what your relationship with this person is. In the Victorian era the Hibiscus flower was also considered to be a representation of glory. This flower was only gifted to people who were considered worthy of it. In China, hibiscus symbolise the fleeting and beauty of fame or personal glory.